If you go into any board game store today, you can hardly turn your head without seeing a dozen Cthulhu or Lovecraft-inspired games. It is a very popular theme, and given the age of these stories and the literally indescribable horrors that populate them, its not hard to understand why. Still, given the sheer number of game based in the Cthulhu mythos, it can get kind of hard to separate the good from the...well, not so good. 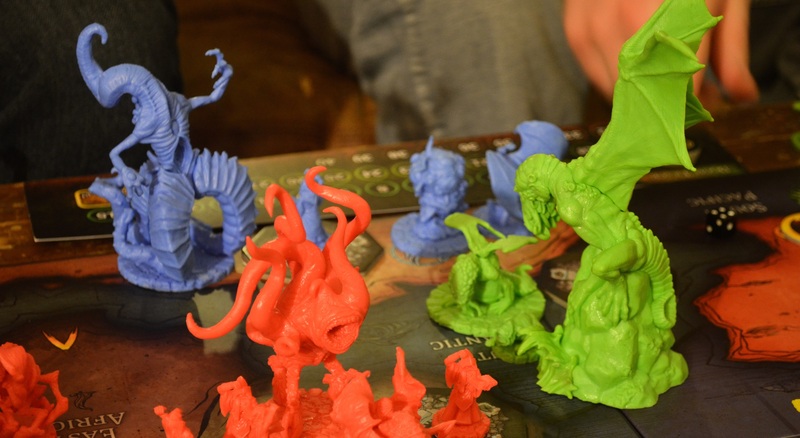 In the summer of 2013, Sandy Petersen, the principal developer of the "Call of Cthulhu" hit tabletop game, started and successfully funded a Kickstarter for his newest project - a strategy board game called "Cthulhu Wars." The Kickstarter campaign earned 1.4 million dollars during it's run, with more than 4,300 backers. Unlike most games from the Lovecraft universe, rather than playing as an investigator trying to lure Cthulhu back to sleep, in "Cthulhu Wars" you actually play as different Elder Gods and wage war against one another on a global scale. 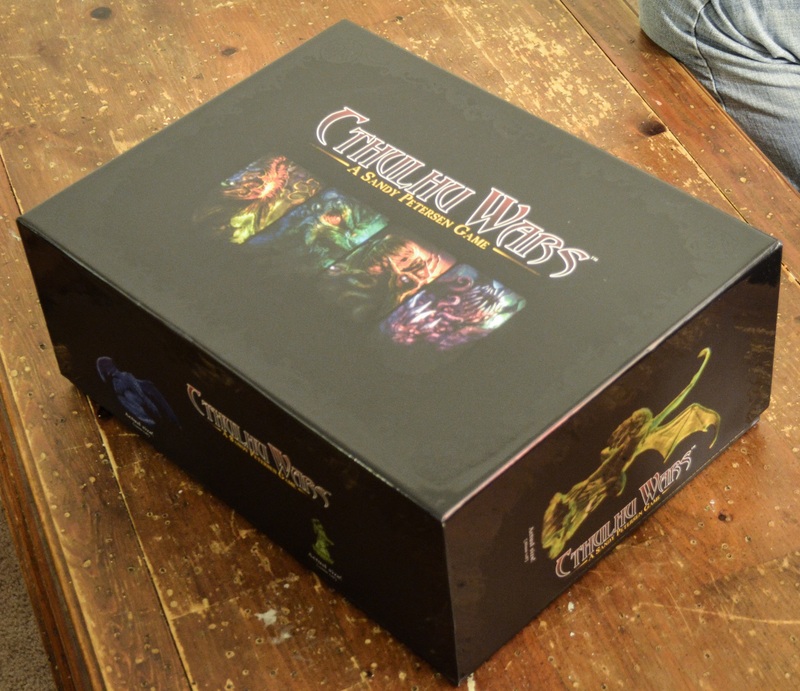 I would be remiss if I failed to immediately address the absolute wonderful quality of the board, pieces and miniatures that are contained in the massive box for "Cthulhu Wars." The board and tokens are crispy printed, with art that fits perfectly into the Lovecraftian theme. The board is double-sided as well, with different locations available on each side which is useful when you have more players and need more spaces to move around in. While the cardboard bits are nice, the real beauty hidden in the box are the miniatures. They are gorgeous. They're made out of thick plastic and every detail on each Elder God, monster or cultist looks perfect. I feel like the group I played with spent fifteen or twenty minutes just passing pieces around and admiring them before we even started playing. They look fantastic, and the Elder God pieces are massive, which really provides an epic scale to the game. If you're into painting miniatures, I've already seem some fantastic paint jobs on the pieces that come with the game and they all look fantastic and really add some extra flavor to the game's theme. 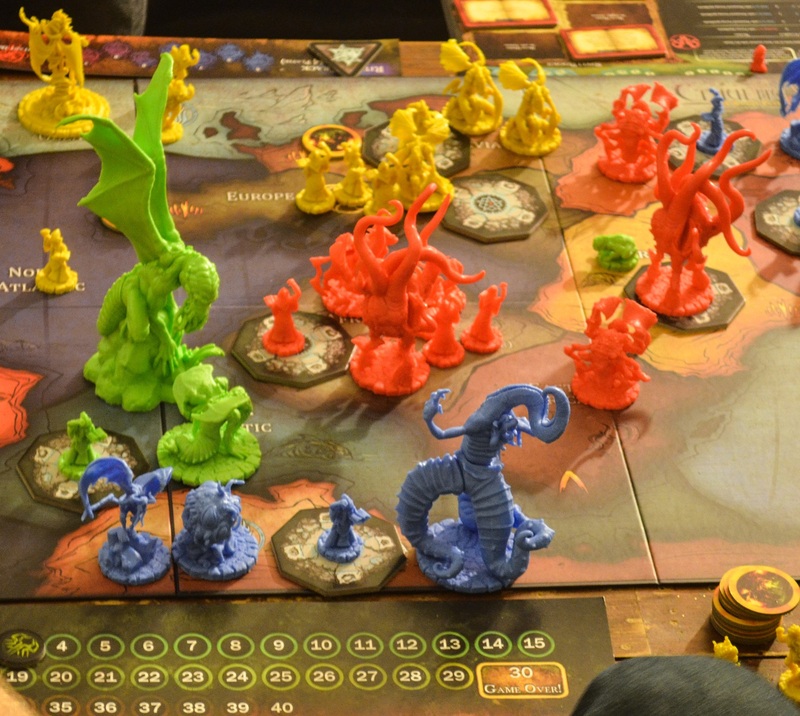 "Cthulhu Wars" is actually not a difficult game to get into. You start the game as a group of cultists on various parts of the planet and...well, from there things get out of hand fast. The goal, put quite simply, is to earn the most victory points (doom points). You do this by building and controlling gates (which give you power and are also used to summon monsters) and using power (which is the currency of the game) to purchase rituals and elder signs. Obviously, having your Elder God out and active on the field is beneficial to calculating doom points at the end of each round. We were playing a four-player game, so the first to 30 "doom points" was the winner. Normally when you play a big box strategy game like this, you expect to sink an entire evening into it. 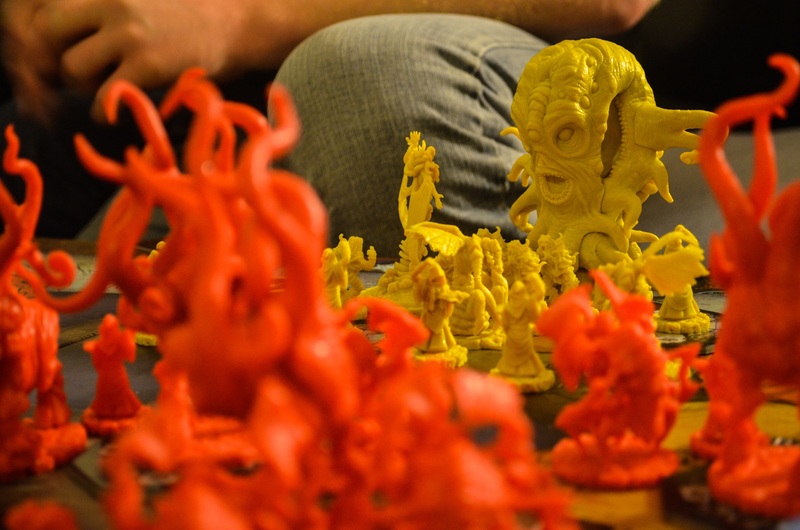 That is not what happened when we played "Cthulhu Wars." Sure, the first time was longer because we were all learning how to play but I'd say we went from start to finish in about an hour and a half. We played another game right after and that one only took about 45 minutes. If I didn't have to work in the morning, I probably would've been game for another. It's delightfully fast. Because of it's speed, there is very little down time between your turns. Cthulhu always starts the game, and they choose the direction that turns will go in (clockwise or counter clockwise). You take one action - either summoning monsters, moving units, building gates - all things which cost different power points. You do one thing, and then the next person goes. Some turns, it barely feels like you have time to think. One of the big strategic aspects of "Cthulhu Wars" is building your spell book. Each Elder God has six spells that they can unlocked that can greatly influence how they play the game. You don't get spells simply by spending power points, though. You have to do something. The first game I played, most of my spells were unlocked by occupying huge tracts of land at the same time. Four locations simultaneously. Six locations. Eight locations. Occupying the same areas as the three other players. The spell unlock list gives you sort of a glimpse of how your Elder God should be played to be really effective. Each Elder God plays differently from one another. In the two games that I played, I had the Black Goat and then Hastur. I felt like the Black Goat had one of the weaker starting points, as she starts surrounded by everyone else - she makes up for it quickly though. While other Elder Gods can only summon one monster at a time, the Black Goat can summon as many as she wants (provided she has the necessary power to do so). While they aren't as strong as some of the other pieces on the board, as long as you have power, you can constantly churn out an army of crazy tentacle-y things that force opponents out of your area. Some of your stronger units can also generate power points for you at the end of each turn (provided you have the right spell). While the Black Goat is kind of a unit factory, playing Hastur is a bit more difficult. For one, he is the only faction (so far) that has two Elder Gods - the King in Yellow and, of course, Hastur himself. This faction is much more nomadic than the other factions. In order for Hastur to have any sort of power, the King in Yellow must first be active and moving around the globe causing desolation. For every desolation token that gets put down, Hastur's combat value rises. Putting down desolation tokens is kind of a random chance deal, in that, you have to roll a dice and get below a certain value (the number of your units on that location). I was terrible at this part, and even with the King in Yellow constantly spawning undead as he attempted to spread desolation, by the time I finally got Hastur on the board, he had a combat value of two. That's the thing with the combat in this game though, it's all dice and randomness. Having a combat value of two simply means he rolls two dice when he's in combat. On a six, something is killed and on a four or five, it causes a "wound" which means the unit flees. Hastur's special ability, however, allows him to choose which units get damaged or killed by the dice. So, if there are six units on each side of a combat, including an Elder God for both side, the ideal strategy is to force kills on your weaker, cheaper units and keep your Elder God in play. Hastur can choose to take a rolled six and immediately apply it to the enemy Elder God and kill it. Just by having Hastur on the field, I basically cleared the entire continent that I was on (Asia/Europe) because no one wanted to risk going into battle against him. Everyone moved away, leaving only skeleton crews to man abandoned gates. Even if they aren't at their maximum power, they can all work as as effective intimidation. No one wants to go up against an Elder God. Back to combat though, one of the things that I don't like about "Cthulhu Wars" is how combat is solved solely by a dice roll. If your side has the higher combat rating, than obviously, you have a better chance of rolling high and killing your opponent, but at the same time, it really feels like it takes away from the epic scale of the game. In the second game I played, I watched as Cthulhu - the god that this game is named after - get killed by one of the weakest monsters in another faction. Cthulhu rolled low on all his dice and the monster rolled a six. Cthulhu is killed and the monster walks away with one wound. 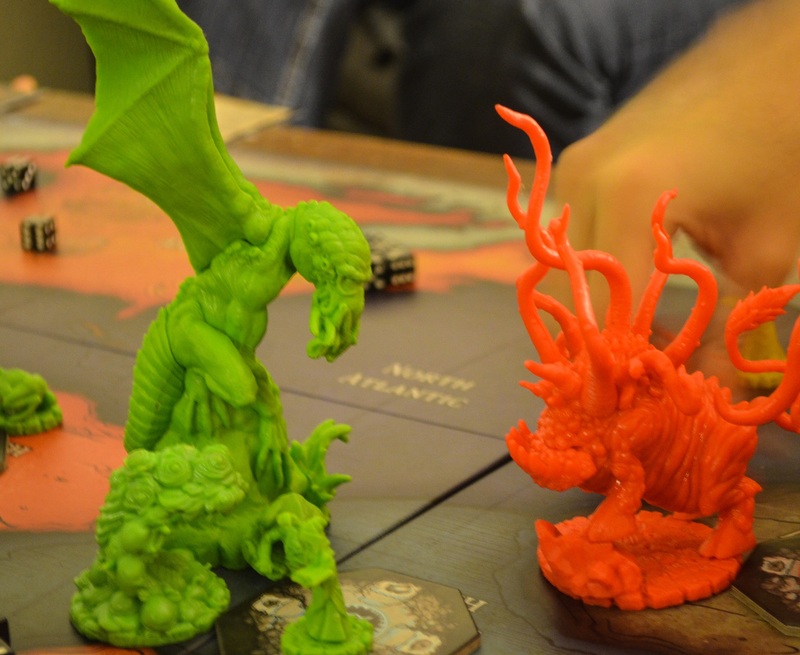 Currently, there are four factions available - Cthulhu, Black Goat, Hastur and Nyarlathotep, which means that the game is currently for 2-4 players, but there are plenty of expansions coming out which will make it possible to play with up to seven people. 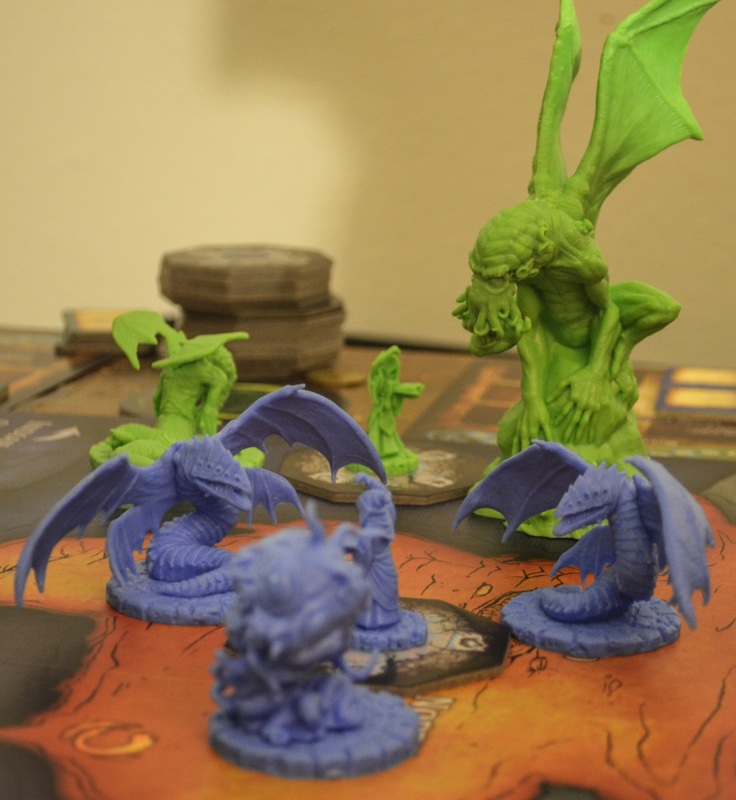 "Cthulhu Wars" is a unique strategy game experience. It has an epic scale, but you can play a game in less than an hour. Each faction has a different play-style which takes time to master. There are numerous ways to get doom points and claim victory - in the first game I played, the winner won by consistently owning the most gates and in the second game, the winner won by having earned the most elder signs. And the pieces are solid and magnificent to behold. If you're tired of the normal Lovecraft game where you're another investigator trying to lure another Old One back to sleep, than I highly suggest you try out "Cthulhu Wars" and, for once, actually mean to bring about the apocalypse. It is a very satisfying experience. You know the old saying: Ph'nglui mglw'nafh Cthulhu R'lyeh wgah'nagl fhtagn. 1. Dice used to determine combat takes away from game's scale.